I am sitting here listening to The Statesmen Quartet, the Memphis vocal group that exerted tremendous on the young and impressionable Elvis. It is great Sunday morning music. Earlier in the week I received in the mail a publisher’s advanced copy of Smithsonian Civil War: Inside the National Collection and have been enjoying it very much. What I like the most about the Smithsonian Institution is its interdisciplinary approach to its collections and museums. It covers out national heritage from different perspectives—scientific, historic, artistic, cultural, and so on. Since the start of the Sesquicentennial I have visited numerous Civil War-related exhibits at different Smithsonian museums; each one had a different shift of emphasis and added to my understanding of the war. This book takes that approach, drawing on the resources of thirteen different Smithsonian archives and museums. Another thing I like is that the editors have kept Smithsonian itself as the central aspect of the book. Thus, we read how collecting the Civil War started as almost an afterthought and grew organically from there. Books like the recently published Lincoln’s Citadel describe the chaos, violence, and dirtiness of Washington City during the war. 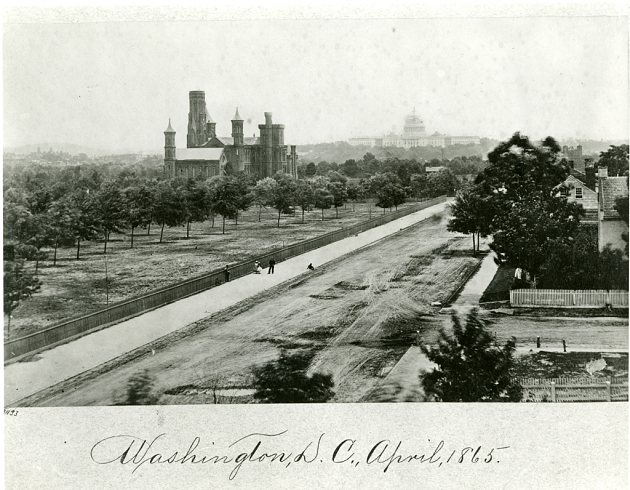 Like Lincoln, Smithsonian director Joseph Henry lost his son to typhoid during the war. What we now know as The Castle was partly lost to fire in January 1865. My favorite Smithsonian museum is the National Portrait Gallery, which is housed in the old Patent Office. I recognized many of the artifacts in the book from the NPG, as well as other places. Walking the halls, you half expects to encounter Walt Whitman or Clara Barton coming your way. There is nothing like seeing the real deal, which is why we visit. In the photographs and concise essays of this new release, the Smithsonian has done a good capturing that excitement.